It was Angie's daughter who found the small, gray tabby kitten and brought it home, but it was her granddaughter, of course, who named it MeowMeow. When the landlord said MeowMeow had to go, Angie happily took it to her home in French Settlement. 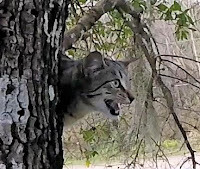 MeowMeow had been there only one week when some dogs belonging to some weekend visitors down the street chased MeowMeow up a tree. All these experiences were new to MeowMeow, and he did not know how to climb down. So he did what he knew how to do best: he cried. Angie worked and tried so hard to get him down, but failed at every turn. 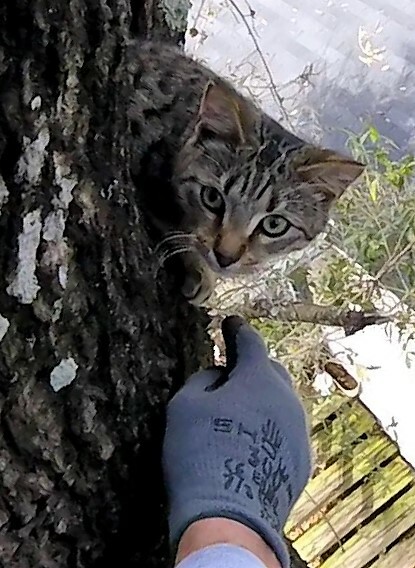 It was on MeowMeow's third day in the tree when Angie learned about me and gave me a call. MeowMeow sounded like a dream of a cat to rescue, and I went out there as soon as I could get ready. 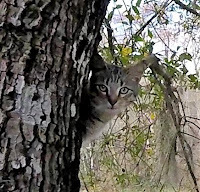 When I arrived and stepped out of my truck, I could hear MeowMeow crying and soon found him in the tree. He was only 20 feet high, and while the tree was not ideal for climbing, it was manageable. While I was installing my rope, MeowMeow climbed up higher, but it was more from happy energy than fear. He seemed to know that this new activity below was going to be good news for him, and he just had to do something. Even though he climbed up a short, vertical limb, he managed to come back down and go back to his original spot by the time I finished installing the rope. 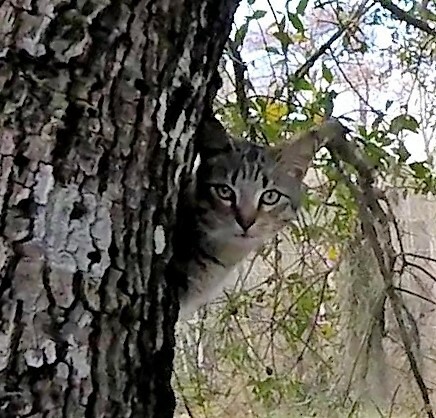 I climbed up to him while he peered around the trunk of the tree to watch. When I removed some dead limbs that were blocking my path, he got nervous for a moment, but then quickly settled back down. Once I was within reach, I stuck my hand out to him to sniff. He was satisfied with that and let me pet him. 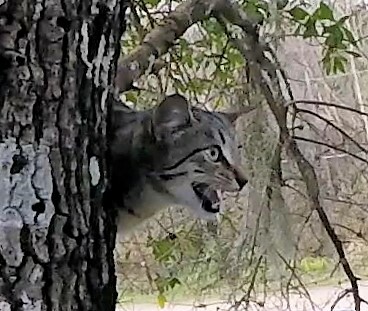 I didn't see any point in prolonging his stay in the tree, so I presented the open carrier to him to see if he would walk inside. He took one step in and then pulled back. He didn't seem to be ready for that. I tried again, and he sniffed it and looked on the top and the bottom, but appeared to be trying to push it away with his head. I was about to give up or at least open some food for him, when I decided to give it one more try. This time, he was ready and walked inside. I closed the door and brought him down. 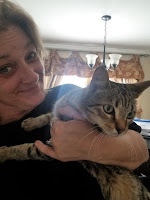 Back on the ground, I gave the carrier to Angie, and she took him inside to release him. She was very relieved and happy to have a resolution to the tension she had endured for the past three days, and she took this selfie to document the occasion. 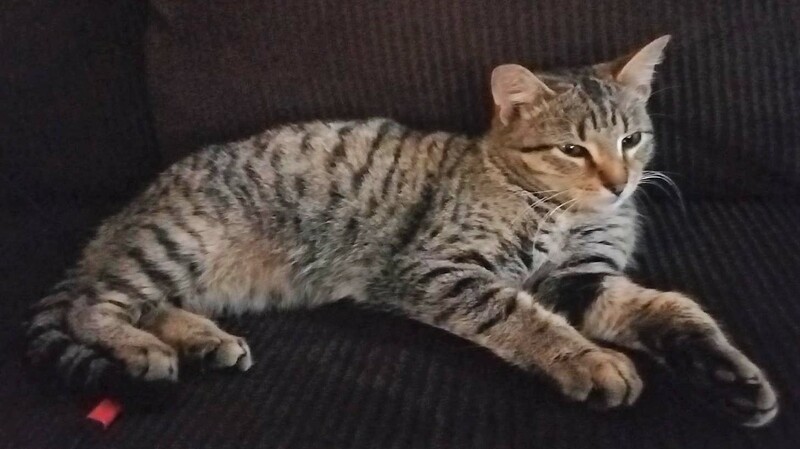 Later, she sent the picture below of MeowMeow resting after his rescue. 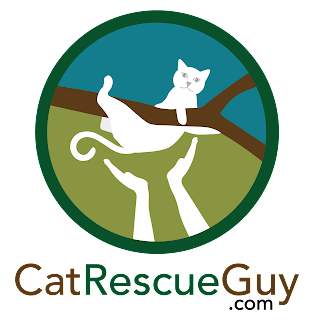 It is always a joy for me to have an easy rescue like this for a sweet kitty and grateful owner, so I felt good as I packed up and left. I feel lucky to be able to do this and have so much fun with it.